High-mobility group protein B2 also known as high-mobility group protein 2 (HMG-2) is a protein that in humans is encoded by the HMGB2 gene. This gene encodes a member of the non-histone chromosomal high-mobility group protein family. The proteins of this family are chromatin-associated and ubiquitously distributed in the nucleus of higher eukaryotic cells. In vitro studies have demonstrated that this protein is able to efficiently bend DNA and form DNA circles. These studies suggest a role in facilitating cooperative interactions between cis-acting proteins by promoting DNA flexibility. 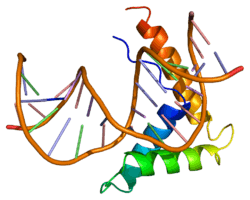 This protein was also reported to be involved in the final ligation step in DNA end-joining processes of DNA double-strand breaks repair and V(D)J recombination. ↑ Majumdar A, Brown D, Kerby S, Rudzinski I, Polte T, Randhawa Z, Seidman MM (Dec 1991). "Sequence of human HMG2 cDNA". Nucleic Acids Research. 19 (23): 6643. doi:10.1093/nar/19.23.6643. PMC 329240 . PMID 1754403. 1 2 "Entrez Gene: HMGB2 high-mobility group box 2". Alexandre S, Li WW, Lee AS (Dec 1992). "A human HMG2 cDNA with a novel 3'-untranslated region". Nucleic Acids Research. 20 (23): 6413. doi:10.1093/nar/20.23.6413. PMC 334538 . PMID 1475204. Shirakawa H, Yoshida M (Apr 1992). "Structure of a gene coding for human HMG2 protein". The Journal of Biological Chemistry. 267 (10): 6641–5. PMID 1551873. Bernués J, Espel E, Querol E (May 1986). "Identification of the core-histone-binding domains of HMG1 and HMG2". Biochimica et Biophysica Acta. 866 (4): 242–51. doi:10.1016/0167-4781(86)90049-7. PMID 3697355. Zwilling S, König H, Wirth T (Mar 1995). "High mobility group protein 2 functionally interacts with the POU domains of octamer transcription factors". The EMBO Journal. 14 (6): 1198–208. PMC 398197 . PMID 7720710. Shykind BM, Kim J, Sharp PA (Jun 1995). "Activation of the TFIID-TFIIA complex with HMG-2". Genes & Development. 9 (11): 1354–65. doi:10.1101/gad.9.11.1354. PMID 7797075. Paull TT, Haykinson MJ, Johnson RC (Aug 1993). "The nonspecific DNA-binding and -bending proteins HMG1 and HMG2 promote the assembly of complex nucleoprotein structures". Genes & Development. 7 (8): 1521–34. doi:10.1101/gad.7.8.1521. PMID 8339930. Wanschura S, Schoenmakers EF, Huysmans C, Bartnitzke S, Van de Ven WJ, Bullrdiek J (Jan 1996). "Mapping of the human HMG2 gene to 4q31". Genomics. 31 (2): 264–5. doi:10.1006/geno.1996.0046. PMID 8824816. Nagaki S, Yamamoto M, Yumoto Y, Shirakawa H, Yoshida M, Teraoka H (May 1998). "Non-histone chromosomal proteins HMG1 and 2 enhance ligation reaction of DNA double-strand breaks". Biochemical and Biophysical Research Communications. 246 (1): 137–41. doi:10.1006/bbrc.1998.8589. PMID 9600082. Boonyaratanakornkit V, Melvin V, Prendergast P, Altmann M, Ronfani L, Bianchi ME, Taraseviciene L, Nordeen SK, Allegretto EA, Edwards DP (Aug 1998). "High-mobility group chromatin proteins 1 and 2 functionally interact with steroid hormone receptors to enhance their DNA binding in vitro and transcriptional activity in mammalian cells". Molecular and Cellular Biology. 18 (8): 4471–87. doi:10.1128/mcb.18.8.4471. PMC 109033 . PMID 9671457. Yumoto Y, Shirakawa H, Yoshida M, Suwa A, Watanabe F, Teraoka H (Sep 1998). "High mobility group proteins 1 and 2 can function as DNA-binding regulatory components for DNA-dependent protein kinase in vitro". Journal of Biochemistry. 124 (3): 519–27. doi:10.1093/oxfordjournals.jbchem.a022143. PMID 9722660. Aidinis V, Bonaldi T, Beltrame M, Santagata S, Bianchi ME, Spanopoulou E (Oct 1999). "The RAG1 homeodomain recruits HMG1 and HMG2 to facilitate recombination signal sequence binding and to enhance the intrinsic DNA-bending activity of RAG1-RAG2". Molecular and Cellular Biology. 19 (10): 6532–42. doi:10.1128/mcb.19.10.6532. PMC 84623 . PMID 10490593. Butteroni C, De Felici M, Schöler HR, Pesce M (Dec 2000). "Phage display screening reveals an association between germline-specific transcription factor Oct-4 and multiple cellular proteins". Journal of Molecular Biology. 304 (4): 529–40. doi:10.1006/jmbi.2000.4238. PMID 11099378. Stros M, Ozaki T, Bacikova A, Kageyama H, Nakagawara A (Mar 2002). "HMGB1 and HMGB2 cell-specifically down-regulate the p53- and p73-dependent sequence-specific transactivation from the human Bax gene promoter". The Journal of Biological Chemistry. 277 (9): 7157–64. doi:10.1074/jbc.M110233200. PMID 11748232. Fan Z, Beresford PJ, Zhang D, Lieberman J (Apr 2002). "HMG2 interacts with the nucleosome assembly protein SET and is a target of the cytotoxic T-lymphocyte protease granzyme A". Molecular and Cellular Biology. 22 (8): 2810–20. doi:10.1128/MCB.22.8.2810-2820.2002. PMC 133744 . PMID 11909973. Dubois T, Howell S, Zemlickova E, Aitken A (Apr 2002). "Identification of casein kinase Ialpha interacting protein partners". FEBS Letters. 517 (1-3): 167–71. doi:10.1016/S0014-5793(02)02614-5. PMID 12062430. Fan Z, Beresford PJ, Zhang D, Xu Z, Novina CD, Yoshida A, Pommier Y, Lieberman J (Feb 2003). "Cleaving the oxidative repair protein Ape1 enhances cell death mediated by granzyme A". Nature Immunology. 4 (2): 145–53. doi:10.1038/ni885. PMID 12524539. Lv X, Xu DD, Liu DP, Li L, Hao DL, Liang CC (2003). "High-mobility group protein 2 may be involved in the locus control region regulation of the beta-globin gene cluster". Biochemistry and Cell Biology = Biochimie Et Biologie Cellulaire. 80 (6): 765–70. doi:10.1139/o02-164. PMID 12555809. Pallier C, Scaffidi P, Chopineau-Proust S, Agresti A, Nordmann P, Bianchi ME, Marechal V (Aug 2003). "Association of chromatin proteins high mobility group box (HMGB) 1 and HMGB2 with mitotic chromosomes". Molecular Biology of the Cell. 14 (8): 3414–26. doi:10.1091/mbc.E02-09-0581. PMC 181577 . PMID 12925773.